Academic libraries have changed significantly in recent years. At least to some extent, their evolution has been the product of planning rather than passive acceptance of, or reactive response to, environmental conditions. 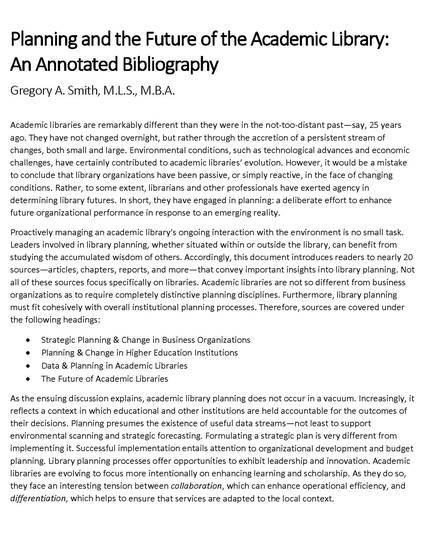 This document introduces readers to nearly 20 sources—representing the fields of business, higher education, and library/information science—that convey important insights into library planning. Academic library planning increasingly reflects a context in which educational and other institutions are held accountable for the outcomes of their decisions. Planning presumes the existence of useful data streams. Successful implementation of a strategic plan entails attention to organizational development and budget planning. Library planning processes offer opportunities to exhibit leadership and innovation. Academic libraries are evolving to focus more intentionally on enhancing learning and scholarship; as they do so, they face an interesting tension between collaboration and differentiation.